PERRYVILLE, Md. — Maddie Carr was born to be an athlete. “Soccer and lacrosse are just like second nature to me,” said the Perryville High School senior. She was also born to be a leader. The lacrosse and soccer standout is dedicated too. “Every weekend I come here to the high school turf. At the end of the day it shows who puts in the extra work. I want to be that person,” Carr said. Her main sport is soccer. “When she’s on the field, she just stands out among her peers just with her leadership on the field and her vision and the way that she’s able to read a play before it happens,” added Borrelli. The four-year varsity star for the Panthers also plays for Premier Soccer Club. She’s the top goal scorer in the Eastern region. This fall she’ll be playing soccer for Towson University. She’ll be one of those fantastic Tigers soon. Off the field she wants to study business and marketing. She’s challenging herself in the classroom now. “Classes here I take are honors classes, college classes,” she said. “Maddie can achieve anything she wants to in life. Four years at Towson, she’s going to do awesome there. I’m sure,” said Borrelli. 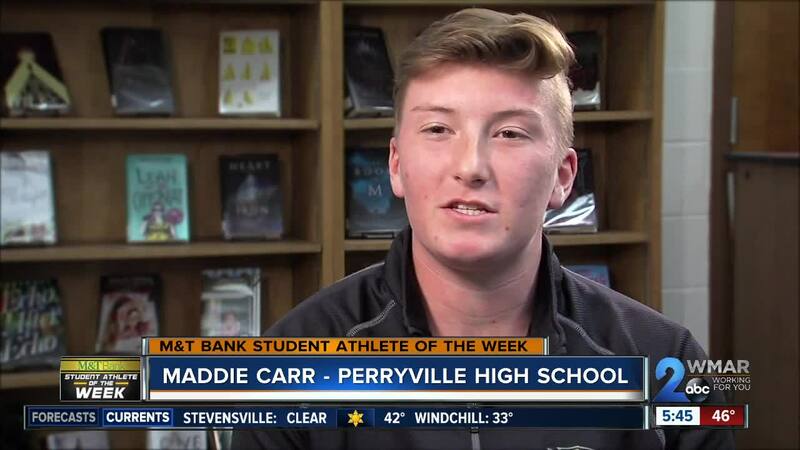 Congratulations Maddie Carr. You’re this week’s M&T Bank Student Athlete of the Week.